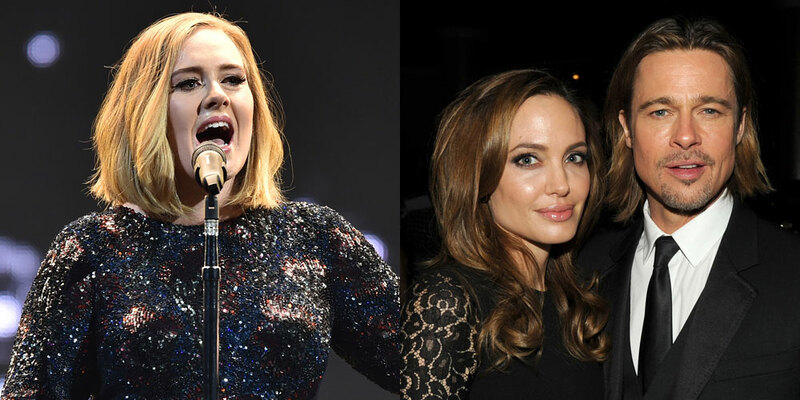 Adele is in shock by the divorce announcement of her favorite celebrity couple Brad Pitt and Angelina Jolie. The Singer is awfully hurt by the shocking split that she announced to dedicate her concert to the former couple during her live performance on Tuesday evening (September 20, 2016). The 28-year-old was performing for her already slated 7-night show at Madison Square Garden of New York when she came to know the news of Angelina filing papers for divorce from her actor husband Brad Pitt. The singer said it was really miserable to come under the shock of the split and she never had even imagined that they would ever part their ways specially after being parents of six children. It was the depression that made Adele address the split right after she arrived onstage. She was feeling herself restless and helpless. Adele told the audience she had to address the elephant in a small space; unfortunately a beautiful era had ended. The Hello hit-maker then announced that she was dedicating her concert which she captioned "2 hours of misery" to her two favorite stars, Brad and Angelina. The shocking news of Angelina's divorce not only emotionally hit celebrities like Adele but also stunned the public who has been loving both the stars as a couple and had, in fact, idealized their married life. With the announcement of filing divorce, it is no longer hidden that the ideal celebrity couple was actually having irreconcilable differences in their relationship which lead the actress to file a legal divorce from the father of her children. The media report also confirms that she has also submitted a legal application for her six children's custody. The legal documents she filed read the date of their spilt as September 15, 2016. Following the announcement of filing divorce, Robert Offer, who is serving Angelina as a professional lawyer told the media the 41-year-old has filed for dissolution of her nuptials. He added Angelina decided to file the divorce for the good health of her family and she is assertive she is not going to comment or reply to anyone on the matter. Offer revealed the actress has asked her fans and other media people to give them their due privacy at this occasion. Following the news, Pitt released a press statement revealing his grieve on the divorce. He says he is very sad with this and he thinks the most important thing that now matters the most is the welfare of their offspring. The actor requested media to give the couple their due space during this challenging time. Angelina and Brad met during the shooting of Mr. & Mrs. Smith in 2005 and soon became friendly with each other. It is noteworthy that Brad was not single while he was dating Angling as he had already tied knot with Jennifer Aniston some while ago. However, the intensity of the actress’s love made him break the marriage with Jennifer and marry Angelina in 2014. Adele is to end her 7-night run on coming Monday. She will then depart from Madison Square Garden and will arrive at Washington DC for another live concert which is slated to take place on October 10, 2016.